The crime of burglary involves entering a structure with the intent to perform a crime within the structure. The structure can be a home, store, office, barn, shed or any other structure. The person who enters the property does not have to successfully commit a criminal act inside of it to be accused or convicted of burglary. The individual only has to have the intent to do such. Furthermore, the burglar is being accused of entering a property that he or she has no right to access. Many people get the crimes of burglary, robbery and theft confused. 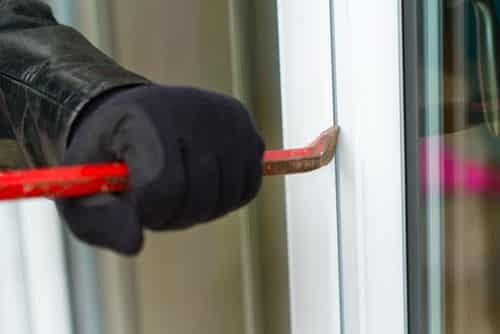 Burglars usually do have the crime of robbery or theft in mind when they enter the forbidden properties, but the three crimes differ greatly. Robbery is the violent act of taking property from another person through scare tactics or force. Theft involves depriving a person of his or her property in either a straightforward or deceitful manner. A burglar does not have to take anything to receive an accusation or conviction of the crime. The punishment for such a crime is harsh even if the burglar does not touch one item in the dwelling. The penalty for burglary depends on the situation and circumstances of the crime. First, the authorities will look at whether the property is a dwelling or someone’s home. If the property is not a person’s home, then the penalty is lighter, but still heavy. It is a 2nd-degree felony in that case, and the offender may face up to 10 years in prison without reliable counsel. If the burglary involved a person’s home, and people were in the home at the time it occurred, then the penalty is stiff. The crime is a 1st degree felony at that point, and the person must face a penalty of up to 20 years in prison. An accused person can fight a burglary charge with appropriate counsel. The attorney can take several angles to defend the person. First, the attorney can challenge the prosecution to prove the intent of the burglar to perform a criminal act. If the prosecution cannot prove ill intent, then the judge may have to rule an acquittal. If the defense can prove that the individual had an assumed right to be on the property, then the judge will have to rule an acquittal. The Fishman Firm is a Philadelphia law office that focuses on the defenses crimes such as burglary and the other mentioned offenses. You can contact us if you have been charged with burglary in Philadelphia. the faster you make contact with our firm, the faster an experienced attorney can get to work on your case.